Searching for the right sandals that can offer the right support because of Plantar Fasciitis that men and women need can sometimes be hard. For some, they find searching for the right footwear hard because their feet are just too painful. There are various sandals that are available but not all of these will give the comfort, support and durability that people need in order to be content with their footwear. Are you also having trouble with searching for the right footwear? Here are just some of the brands and products that you can try. The Oofos Original Unisex Black Thong Sandals is sometimes said to be expensive, people know that it is worth every penny. Aside from the fact that it can be used both indoors and outdoors, it can help save family vacations and tours with friends because of the added comfort that it can give. It has more cushioning and natural articulation that will make it possible for people to feel extremely comfortable while wearing it. It has 37% more impact absorption than other slippers which makes it less painful to walk, dance or shop around. The arch support also works best for people with various foot conditions. Cleaning this pair of slippers can be a breeze because it is machine washable. 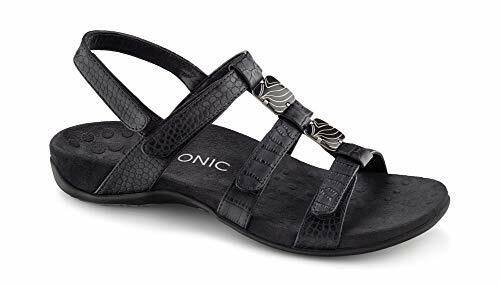 The Vionic Women’s Tide II Toe Post Sandal comes in a variety of colors which will make it easy for you to choose which one you would like to get. It is made out of synthetic leather and webbing upper material which gives it a distinct look. The orthotic foot bed has been created specifically to help different people with various foot conditions. The orthotic foot bed will help the feet revert back to its normal position to ensure that it will not get strained or stretched. If you would like to make the pain on your feet brought about by wearing wrong shoes or by straining your feet, you can use Vionic Women’s Tide II Post Sandal for minimal pain. Want to wear sandals that look stylish enough to look like regular shoes? 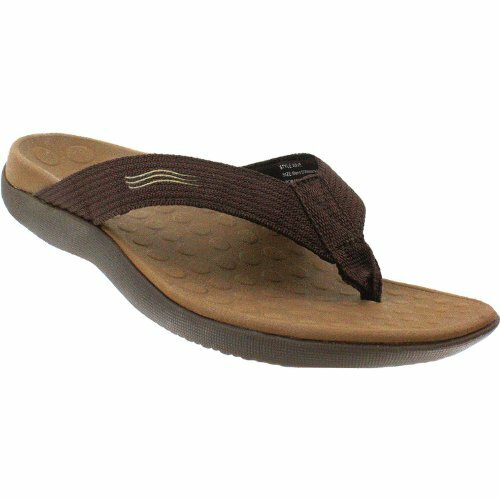 Women’s Vionic by Ortaheel Amber sandal may just be the right product that you are looking for. It is made out of synthetic leather that wraps around the feet in a flattering way and can look great in almost any type of outfit. The natural cork upper foot bed makes sure that the feet will stay comfortable together with the flexible EVA midsole will make sure that the feet will have the support that it needs. The sandals are sensible enough to be used on a daily basis. Its built in orthotics are very helpful too. Want to look good wherever you go? The Ortaheel Tide Slide in Orthopedic sandals is sporty enough to be used during various activities. Vacations can be fun and enjoyed better with the use of this pair of sandals. The moment that you use this while strolling on the beach or maybe taking a walk in the park, you can be sure that your heel pain will be reduced significantly. The incredible support and correction that it can give to the lower part of people’s bodies can be felt significantly. The comfort that it can give you will allow you to walk for a longer period of time. While other people are saying that it is more expensive than other slippers, it can be used for a couple of years or so which makes it worth it. Want a podiatrist designed biomechanical orthotic foot bed that does not only look good but will still give the feet ample support? The sandals can also be used whenever the weather is warm enough. You can use this while you are walking through your garden and the durable rubber outsole will ensure that you will not slip while providing the right support and comfort that you will need. They can last for years too so the amount you will pay for it will be worth it. Ortaheel Men’s/ Women’s Wave Sandals is very helpful for people because it has a natural healing solution that will not only remove the aches and pains that people are feeling because of various foot conditions. Excess pronation which is usually associated with having flat feet can also be avoided because of the orthotic technology. The EVA midsole are in charge of reducing stress that can be felt on the feet. Sometimes, the ankles and knees can also benefit as a result. One of the best things about this pair of sandals – it is not as expensive as the other sandals that can be bought from the podiatrist office. This type of sandals tends to elicit some stares from other people. This is because its design is not very common. The open toe sandals separate all of the toes and you probably will not see this design elsewhere. The non marking outsole is perfect even when you are strolling through wet places. Imagine walking along the pool side with these sandals. You can be sure that the non marking outsole will get gripper. Some people have commented that it feels like being barefoot so the comfort level that it can give is amazing. Some people who would like to get appropriate support on their feet will find this pair perfect for them. For men who are looking for sandals that they can wear almost all the time, the OOFOSS Original Thong Sandal may be the best sandals to try out. The patented OOFoam can act as a shock absorber so even if you need to run while wearing this, you can be sure that you will not feel any pain. The sandals are soft and durable. The extra cushioning will surely be very helpful for those with arthritic feet. This may be the best sandals for people who would need to use it even during the rainy season since the sandals do not absorb water. This is machine washable so cleaning up can be a breeze. The popular flip flop gets an upgrade with Stridetek Flipthotics Orthotic Sandals. 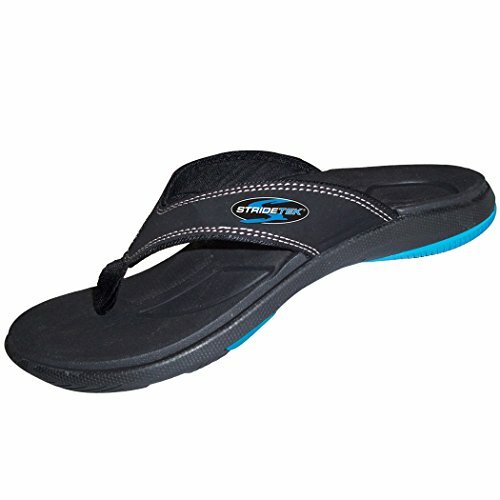 You will not only get fit flops; you will get unmistakable comfort and support. For those who have high arches, this can be perfect whether you are just going to stroll around the mall or you are going to use the sandals to do trekking and hiking, you can be sure that your arches will be supported well. The heel cup will also give ample support to stop the feet from aching. It can also correct problems with the feet, ankles and knees. Can you imagine yourself using these sandals for running too? Some people have tried it and do not regret it at all. 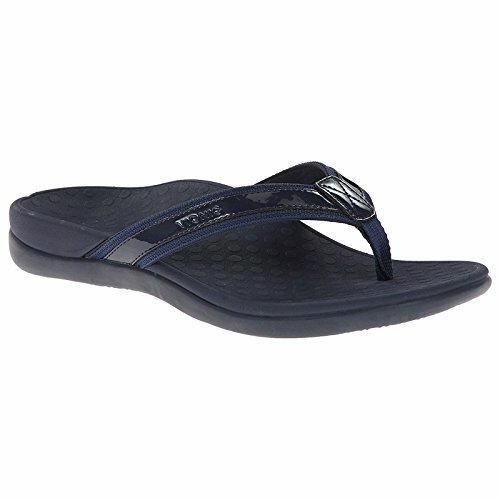 Want to find sandals that can be casual enough to be used like regular rubber flip flops yet classy enough to be used when you like to use it in another place other than the beach or the pool? The Ortaheel Wave Sandals may be just the right sandals you are searching for. The podiatrist designed biomechanical tri planar motion control foot bed will make it possible for the whole arch of the foot to be supported well. The EVA medium density EVA will absorb stress that might be felt on the feet. Foot pain will be almost nonexistent with these sandals. Looking for sandals that can give you all day support? Vionic with Ortaheel Technology Unisex Wave Orthatic Sandals can give just that. The high firm arch of this pair of sandals can take some getting used to but the moment that you get used to it, you will never feel pain for quite a long time. Just make sure that you will get the right size for you since sizing can be a bit different from usual especially if you have wide feet. Wear this whenever the weather permits you to do so. A lot of women say that they think that this style will be more preferred by men however because it is somewhat wide. With the right sandals mens sandals with arch support or women’s sandals with the best comfort can make a lot of difference. I'm much conscious about my foot health, and that's why am here to aware the World that how important it is to take care of your foot.